The earliest record of St. John’s stems from a June 1955 issue of the Mount Vernon Democrat citing an article in the South Western Advocate of 25 May 1855, “All persons interested in the establishment of an Episcopal Church in this town…meeting will be held at the courthouse Monday next for the purpose of organizing a Protestant Episcopal Church in Mount Vernon and electing a suitable number of Wardens and Vestrymen.” Diocesan records show Bishop George Upfold preached at Mount Vernon, a missionary station in 1857 with clergy being assigned from New Harmony to conduct services. 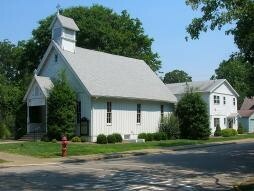 St. John’s was first listed in parochial reports at Convention in 1862 as a Missionary Station, The Rev. W. S. Rowe, Deacon Minister. The Church that year had one infant baptism, one communicant removed, seven current members, one funeral and services performed 34 times. St. John’s was without a permanent home, services being held in member’s homes. It was not until 1892 the physical church was built. 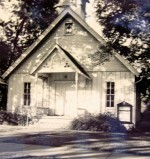 The first services held in the new building in April of 1893. 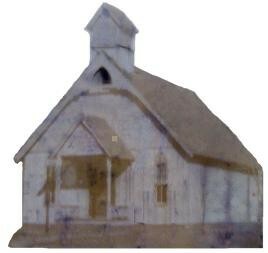 Physically the church building has not changed much from the 1894 photo found in the prayer book of Mrs. Herbert B. Fitton. Trees have come and gone, a parish hall was built, then added to, and the surrounding area went from vacant lots to well established homes. Currently the church is completing the stained glass window project started in 2005 with the new window behind the altar of St. John on the Island of Patmos. Upon completion St. John’s will have stained glass windows replacing the original yellow glass in all windows of the church proper. The new windows are dedicated to church families past and present. St John’s has seen nine Bishops come and go during its lifetime and has been served by 49 clergy during its 152 years. Many of the early clergy served not only St. John’s, but St. Stephen’s, New Harmony and St. Paul’s, Evansville as well. It was in 1986 under the tenure of The Rev. Joseph Dunne St. John’s acquired parish status at Diocesan Convention moving from 124 years as a mission in the southwest corner of Indiana. The wo men have always been a driving force in the parish life of St. John’s. The 12 July 1892 Mount Vernon Democrat tells of “the ladies of the Episcopal Guild who have been soliciting subscriptions for the purpose of building a church have met with great success. They have succeeded in raising the necessary funds, the contract has been let and the erection of the church will be commenced at once.” According to the history of St. John’s written by Gene and Mary Jane Brooks in 1976 the women were active in making surgical dressings for the Red Cross during World War I, they paid to have the church painted in 1914 and for the basement and furnace in 1916. The women had teas, card parties and sold everything from candy to sponges in order to keep the church running during its early years. Throughout the years women have served on the Altar Guild, in the choir, as outreach workers, as teachers and as money makers to keep the church functioning. Even with all of their efforts St. John’s was closed for ten months in 1925 due to a shortage of clergy. Upon reopening there were years of financial struggle. The Woman’s Guild remained active refusing to give in to discouragement, placing their trust in God for the continuance of St. John’s. It was in 1943 a Bishop’s Committee was formed with Henry Kling serving as vice-chair to “reorganize the church and relieve the women from some of their many responsibilities. In 1955 St. John’s celebrated its 100th Birthday with The Rt. Rev. Richard A. Kirchhoffer presiding. A new organ had been installed for the event. Priests from area Episcopal churches took part in the services. A parish dinner at the Elks club was held and Mrs. Fitton provided the attendees with a history of the church. The 1960s saw an increase in attendance at St. John’s. Large families such as the Ozinga’s and the McCullough’s provided a need for a Sunday school and one was formed c. 1957 to meet this need. The Sunday school is still active today serving children from pre-school through high School. Diane Stover is the current supervisor. General Electric Plastics Division in Mount Vernon has had a big influence on the size of the parish. Many church members have moved in and out of the community during their careers at GE. The early 1990s were a time when the parish saw many move away to new stages of their lives. In 2005, St. John’s celebrated it’s 150th year of serving Christ in the community. St. John’s also called its current rector, The Rev. Allen Rutherford. He and his family live in Mount Vernon. There is spiritual growth in the parish under Fr. Allen’s guidance. St. John’s is making new history everyday with community involvement, worldwide outreach and the people who make up the church. Recorded Marriage: 10 July 1894, between Edith Blunt and Frank Mitchell. Reverend Morgan minister in charge.